Swype is a virtual keyboard from Nuance Communications that allow users input text onto a device using gesture motion. Swype had featured in Android platform since 2008 with 1 billion devices worldwide, but with the release of Swype Keyboard for iOS, Apple users are now getting into the action. With Swype, users can input text not by tapping keys but dragging a finger or stylus between the letters in a word. Swype delivers the incredible gesture-typing experience by using error-correction algorithms and language models which learn from the way user input text to guess the intended word. In addition, it also comes with five different keyboard themes and added a bunch of extra keys to the main keyboard such as comma, period, and a dedicated return key. Swype keyboard is available in English, French, Italian, German, Spanish, and more languages coming soon. So that, users can easily selects a language by toggle between it and other languages by holding the space bar. 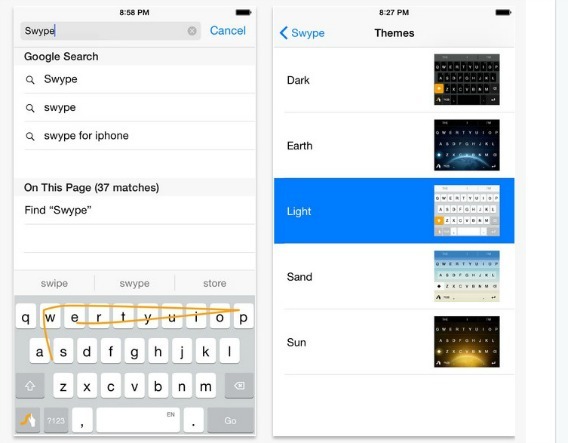 Swype keyboard will be available for 99 cents in Apple AppStore to kick off a competition between developers – SwiftKey and Apple’s own keyboard – QuickType keyboard. If you want Swype keyboard for iOS, users need a device running at least iOS 8. Once installed, just follow the app’s instructions to enable the Swype keyboard.